Oregon Archives Exhibit, "Black in Oregon, 1840-1870"
Salem, OR—When each of us give the Pledge of Allegiance, we place our hand over our heart and promise, “liberty and justice for all.” As your Secretary of State, I have accepted the challenge to promote liberty and justice for all Oregonians. I am doing this through small business assistance, in the Corporations Division, through voter outreach in Elections, through exposing government waste in Audits, and through civics lessons and exhibits in Archives. To obtain liberty and justice for all Oregonians requires a recognition and clear understanding of the history of Oregon minority populations, who have suffered repression, discrimination, and persecution throughout Oregon's history. February is Black History Month. For the past year, Oregon's State Archivist Mary Beth Herkert, Citizen Engagement and Inclusion Coordinator Larry Morgan, Oregon Black Pioneers Secretary Gwen Carr, along with key staff members of the Oregon State Archives, have worked and researched a first-of-its-kind exhibit focusing on African-American families who were part of Oregon's pioneer heritage, from 1840-1870. The exhibit is located at the Oregon Archives Building in Salem and is open to the public Monday – Friday, 8 a.m.-4:45 p.m. until August 24, 2018. The exhibit features stories, photos, and documents of early black pioneers in the Pacific Northwest. The Oregon State Constitution will also be on display. 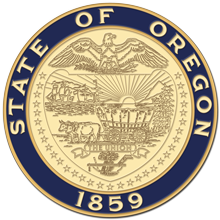 For instance, did you know the Oregon Constitution, written in 1857, contained exclusionary language barring African-Americans from Oregon? Also enacted during this time were various laws prohibiting property ownership, prohibiting interracial marriage, prohibiting settlement by African-Americans in Oregon, and instituting lash laws (the public beating of blacks until they left Oregon). Despite these discriminatory barriers, African-Americans did settle in Oregon. Some came of their own accord, while others were brought as slaves. The Constitution's Exclusionary Clause was finally removed in 1926 by Ballot Measure 3 (the vote was 108,332 to 64,954). In 2002, Ballot Measure 14 passed with 71% of the vote and removed all lingering racist language from the Oregon Constitution.